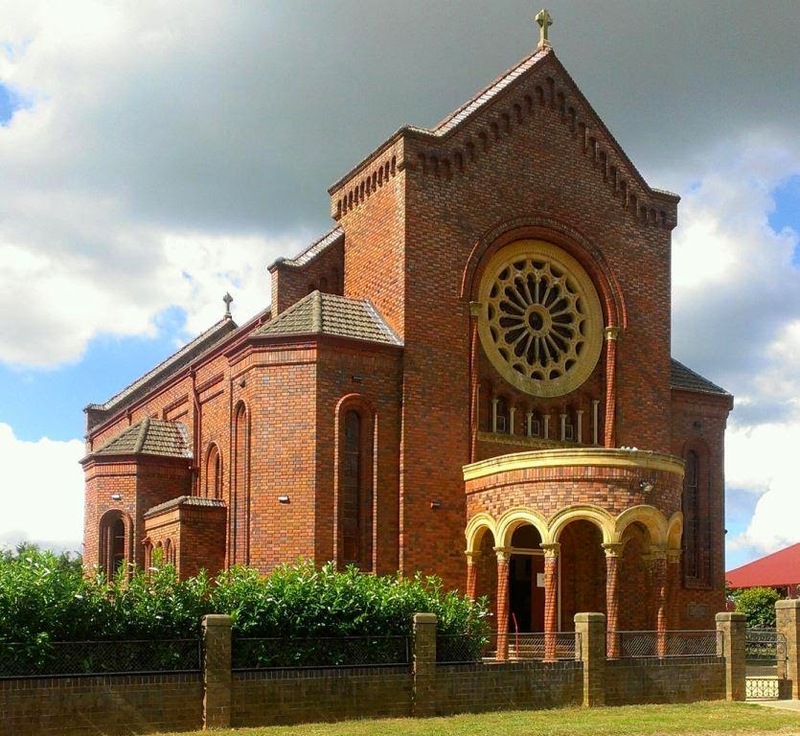 In Australia, after the First World War, ecclesiastical architecture began moving beyond the neo-Gothic which had been the common idiom for churches for almost a century previously. Architects began experimenting in various styles, among them what we might term a vernacular Romanesque. 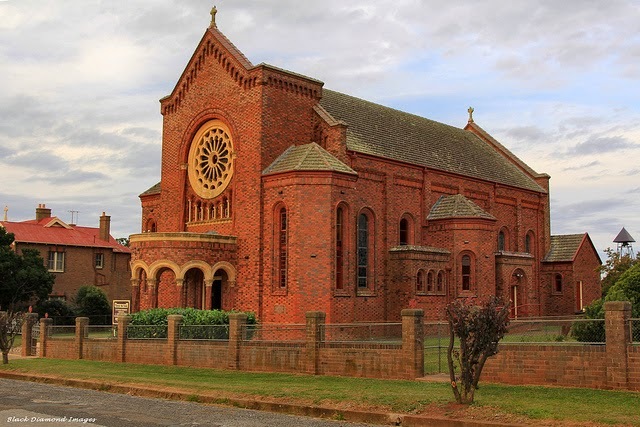 Elements of the Romanesque architectural vocabulary began to be incorporated into new churches all around Australia. Mostly, the exteriors of these buildings were quite handsome and built in brick, often with stone dressings to the doors and windows. Typically, the interiors bore little resemblance to the Romanesque churches of Europe and were less successful. This post includes some photographs of just a few of these churches, but further posts of this genre will appear on this Blog in the future. Church of the Holy Family Maroubra (Archdiocese of Sydney) 1930's. Beautiful proportions with an elegant, uninterrupted facade. 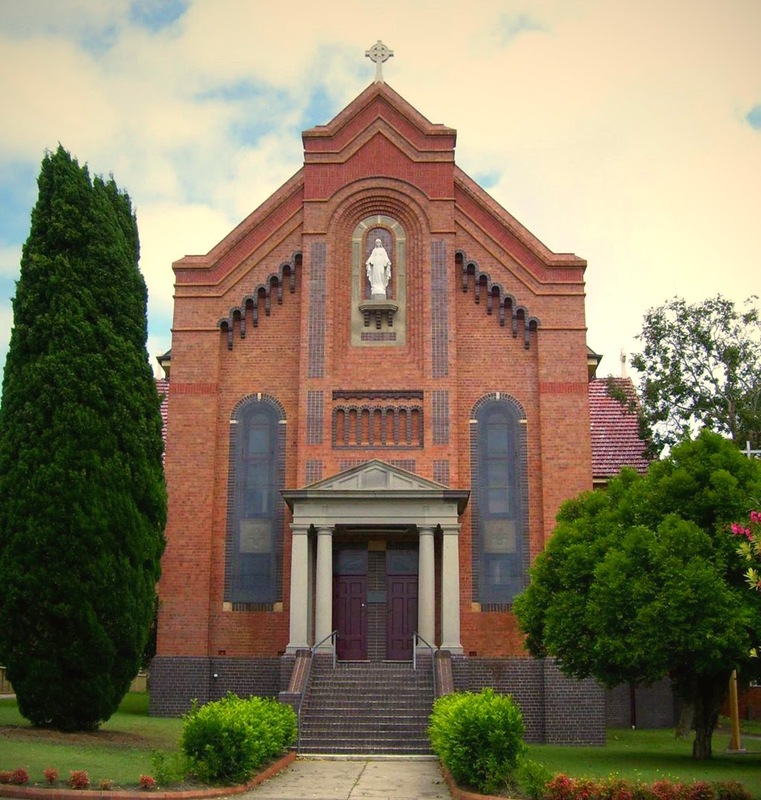 The Church of Our Lady of the Holy Rosary, Taree (Diocese of Maitland & Newcastle) 1930. Architect : Peter J Gannon. This beautifully articulated facade features that arcading frequently found in German Romanesque churches. Here, the facade is enhanced by a polychromatic brick treatment. The classical portico is perhaps slightly out of place. Ugly screens of steel mesh placed over the two windows disturb the proportions of the facade. The Church of Christ the King, Taralga (Archdiocese of Canberra & Goulburn) 1934. This little masterpiece of the neo-Romanesque is found in a small country town. The subtly articulated facade is set-off by a dramatic apse-shaped open portico. Note that the portico is supported on twisted-barley columns made of brick. The wheel window is a true glory. A further view of the Church of Christ the King, Taralaga. it would have been even better. Do you have some further information about these Churches which might of interest to our readers? This Blog is subsidiary to the Saint Bede Studio and presents another facet of our work and ongoing study. The purpose of this blog is to provide materials helpful to those re-ordering our Churches or building new ones. Observations on Catholic architecture (particularly as it pertains to the Sacred Liturgy and its aesthetics) will be presented here. Restoration and re-ordering work of our churches will also be discussed, in addition to newly-built churches. Although the focus will be on illustration by means of available photographs, we will also provide articles and links to articles helpful to those designing and ornamenting churches and their furnishings. Lastly, some of the Saint Bede Studio's own work in this field will be presented for the interest of readers.